Background: Cytoskeleton anchoring of conformational mutant-like p53 is prominent in human senescent cells. The present research investigated the structural basis of vimentin cytoskeleton- anchoring of human p53. Method: GFP-fused wild type p53, mutant p53, those of the various truncated isoforms including p53β and p47, were expressed in the vimentin-expressing cells: mouse fibroblasts, COS-7 cells, young and senescent human fibroblasts, and HeLa cells (non-vimentin-expressing). Result: A cancer-specific mutant p53V143A-GFP expressed in mouse fibroblasts, exclusively anchored on the vimentin cytoskeleton. Class I mutant p53R175C-GFP and class II mutant p53R175S-GFP localized in the nuclei of COS-7 cells. A class III mutant p53R175X-GFP (X: D, F, W or Y), cancer-specific mutant p53V143A-GFP and p53R249S-GFP, exclusively anchored on the vimentin cytoskeleton of COS-7 cells. The deletions of p53R249S and p53V143A at the Cterminus (ΔC63) exclusively promoted the nuclear import of the deleted mutant p53 in COS-7 and HeLa cells, whereas the deletions at the N-terminus (ΔN40) or C-terminus (ΔC33) were ineffective. Thus, the cancer-specific mutant p53R249S and p53V143A adopt distinct mutant conformation and thereby the C-terminal region (aa331-360) potently interacts with the vimentin cytoskeleton and HeLa cells&apos; cytoskeleton. Wild type p53-GFP exclusively localized in the nuclei of growing young fibroblast, in contrast to the significant cytoplasmic retention in senescent human fibroblasts. The deletion of p53 at the N-terminus or at the C-terminus (ΔN40 or ΔC63) results in a significant nuclear import of the shorter isoforms, p53β and p47. 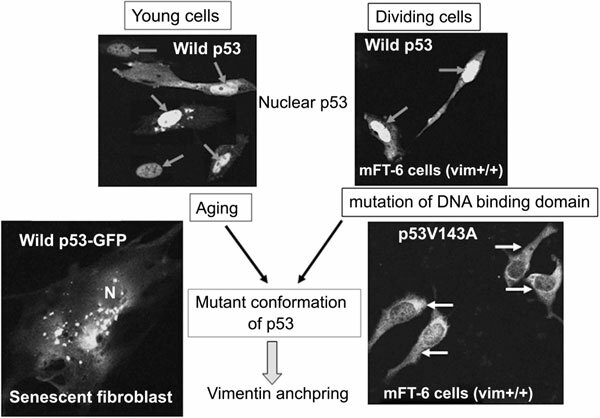 Conclusion: Senescent fibroblasts promote p53 to adopt a hotspot mutant like-conformation which significantly overrides the nuclear import due to the potent cytoskeleton-anchoring. Interestingly, the shorter p53 isoforms can escape from the cytoskeleton-anchoring. Keywords: Cytoskeleton-anchoring, senescence, vimentin, cytoskeleton, senescent fibroblasts, p53, Δ40p53, p53β, ΔC63p53. Keywords:Cytoskeleton-anchoring, senescence, vimentin, cytoskeleton, senescent fibroblasts, p53, Δ40p53, p53β, ΔC63p53. Abstract:Background: Cytoskeleton anchoring of conformational mutant-like p53 is prominent in human senescent cells. The present research investigated the structural basis of vimentin cytoskeleton- anchoring of human p53.